Ships today if you order in the next 13 hours 22 minutes. Who knew that you could get something so nutritious from beer? Brewer's yeast is actually a by-product of the beer brewing process. It comes from the cultivation of Saccharomyces cerevisiae on malted barley. As a food, it provides an excellent source of protein as well as B-vitamins. 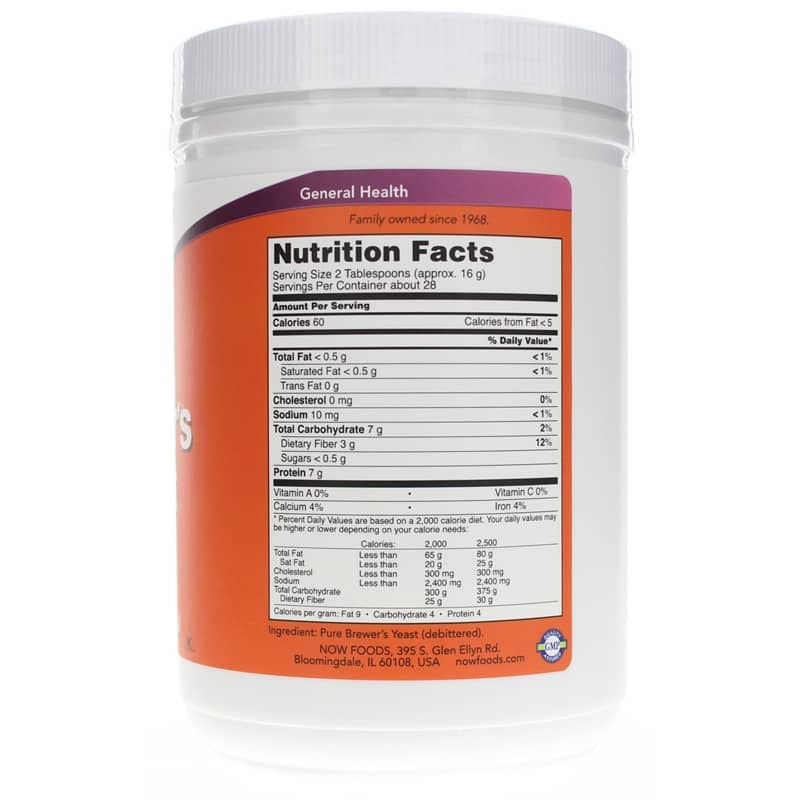 Brewer's Yeast from NOW Foods may also be able to help with certain health issues. It could relieve diarrhea because the yeast seems to stimulate enzymes in your intestines. It may also target harmful bacteria that causes intestinal infections. Plus, research also indicates brewer's yeast could impact blood sugar levels, because of it contains chromium. After fermentation, this brewer's yeast is separated from the beer, roller dried and debittered. That means it's easy to eat without puckering up. You can mix two tablespoons of this product with a glass of juice or milk - even in your morning cereal. You can also add it to other recipes to boost the nutritional content. 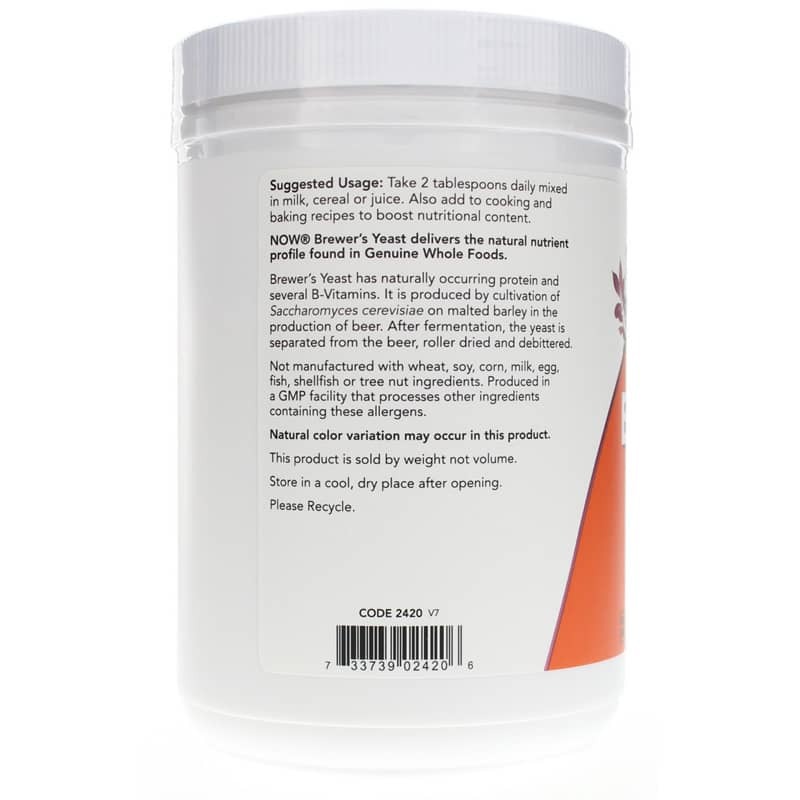 Order your own Brewer's Yeast from NOW Foods and put this nourishing food in your kitchen. Not manufactured with: wheat, soy, corn, milk, egg, fish, shellfish or tree nut ingredients. Produced in a GMP facility that processes other ingredients containing these allergens. Adults:Take 2 tablespoons daily mixed in milk, cereal or juice. Also add to cooking and bakery recipes to boost nutritional content.